There is something very calming in blues music (the term means ‘melancholy’) and photographer Joseph A. Rosen has managed to capture that calmness in his book, Blues Hands. Great music tells a story as do great photos and the two together are sweet music. The photo on the cover, as depicted above, is pretty typical of the sort of photos within. I absolutely loved these close-ups of the hands of these remarkable artists. Most show a life of hard work and love (just look at the way the neck of the guitar is being cradled and played!). But I was equally taken with the instruments. Again, most showed instruments that are well-worn and likely to have traveled with the artist for most of his/her life. These are really tremendous and the photos capture the give and take of the artist and the instrument and the synchronicity of the two together. My only ‘complaint’ here is that there are too many photos that are not of the hands of the artists. For instance, in the photo of James Brown, his hand is blurry but his face is crystal clear. This is the sort of photo I could see in nearly any music magazine. Same for Shakura S’aida, or Irma Thomas. Compare these to a photo like that of Alexis P. Suter, in which the focus is the hand and the face is blurry, and I’m much more taken with the hand picture. A few others, in which we see the whole artist (or most of the artist) are also much less appealing. The one exception might be the photo of Levon Helm and Hubert Sumlin – in part because their hands are still the focal point of the photo. I did not know everyone included in the book and there is a really nice, mini-bio (along with a mini-photo to remind you who it is) at the end of the book. All in all, this is a wonderful coffee-table style book that anyone interested in Blues, music, or wonderful photography should enjoy. Looking for a good book? 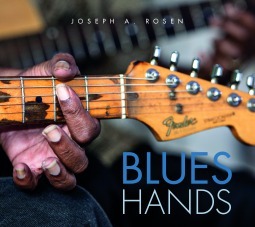 Blues Hands, by Joseph A. Rosen, is a photography book that tells some wonderful stories, with pictures, of Blues artists and is well worth having!